Firefighters struggling to contain destructive Northern California wildfires found themselves facing a new blaze that erupted Tuesday and drove through a rural area near a national forest. About 60 homes in an old ranching and farming area near Covelo, which is about 180 miles (290 kilometers) north of San Francisco, were ordered evacuated as the blaze erupted late in the afternoon. Gusty winds quickly drove it through about a square mile of brush and grasslands, oak, pine and timber near Mendocino National Forest, Mendocino County Undersheriff Matthew Kendall said. However, there were no immediate reports of homes being burned. [post_ads]Firefighting aircraft were called in but it was unclear when they might arrive because many already were engaged in other fires, Kendall said. Some 40 miles (64 kilometers) to the south, twin fires straddling Mendocino and Lake counties have destroyed at least seven homes and threatened an estimated 12,000 more, fire officials said. Jessyca Lytle fled a fast-moving Northern California wildfire in 2015 that spared her property but destroyed her mother’s memorabilia-filled home in rural and rugged Lake County. Less than three years later, Lytle found herself listening to scanner traffic Tuesday and fire-proofing her mother’s new home as another wildfire advanced. Derek Hawthorne, a firefighter and spokesman for the fire crews, said the hot weather was not ideal but the wind was on their side where he was in the city of Upper Lake. “It’s blowing into the fire, and it’s kind of blowing it back on itself,” he said. To the east in Sutter County, a fire that erupted Tuesday night had torched about 1.5 square miles (4 square kilometers) of grassland but no homes were evacuated, state fire spokesman Scott McLean said. Elsewhere, the Carr Fire had burned more than 880 homes and killed six people in and around Redding. Another 348 outbuildings were also destroyed, and the blaze is now the seventh most destructive wildfire in California history, fire officials said. National Park officials said Tuesday the scenic Yosemite Valley and other areas will be closed “at least through Sunday” due to heavy smoke from the so-called Ferguson Fire. The closure began July 25 and had been tentatively scheduled to end Friday. Park spokesman Scott Gediman said “continuing poor air quality” and ongoing firefighting operations warranted the extension. In Riverside County, east of Los Angeles, an arson fire that destroyed seven homes last week was 82 percent contained Monday. People in Lake County, an impoverished community of 65,000, are familiar with evacuations. 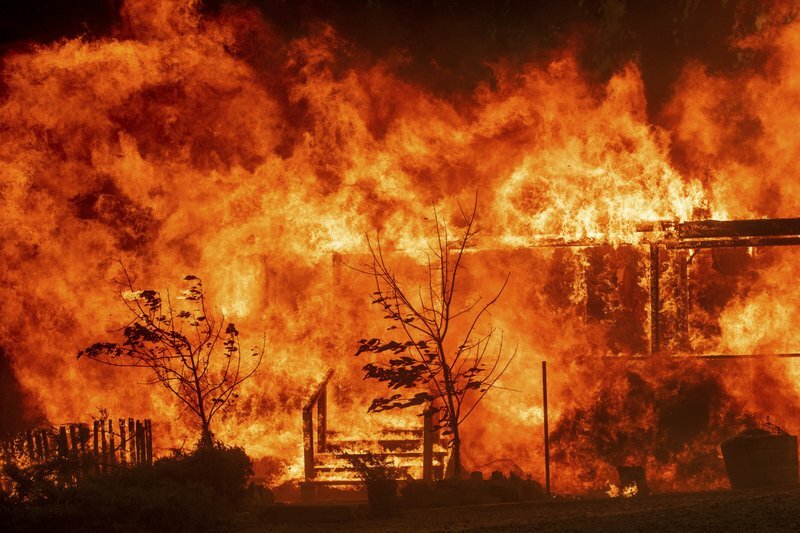 The 2015 Valley Fire, which came on the heels of two other fires, killed four and destroyed 1,300 homes when it blew up unexpectedly during a September heat wave. It wiped out entire neighborhoods prized for their privacy and sense of community and turned scenic areas into charred forest. Since then, parts of the county have been evacuated regularly due to fire, most recently in June. Evacuation orders remained in effect Tuesday for the town of Lakeport, the county seat, although orders for some smaller communities were lifted. Lakeport is a popular destination for bass anglers and boaters on the shores of Clear Lake. By Monday night, it was a ghost town. Lew, who is divorced from Lytle, is camped out at the house in the nearby community of Cobb that she fled in 2015. He is watching over her chickens, sheep and other animals. He laughs that repeated fire alerts have made him an emergency preparation expert.